Rolex made all the original Panerai watches pictured below for the Royal Italian Navy from 1936 to 1956. This watch above is amazing because it seems to be the watch the later Rolex made Panerai watches were based upon. 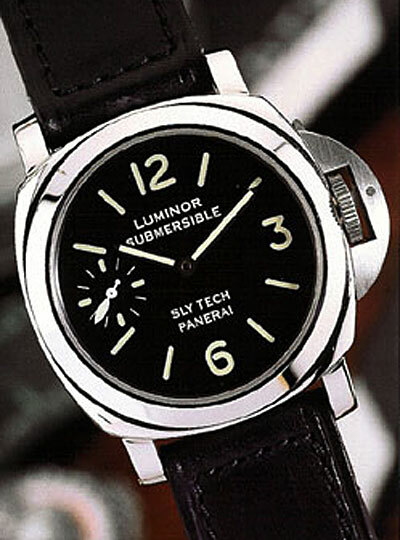 The watch above is smaller at around 30mm than the 47mm Panerai's (as seen below) but the design language is clearly derivative and almost identical. 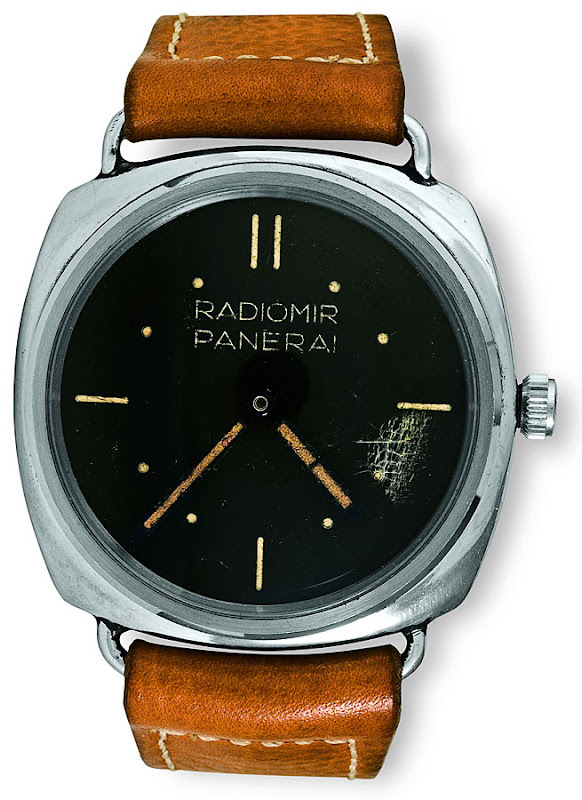 This is the last Panerai Rolex made (pictured above). It was made for the Egyptian Army. 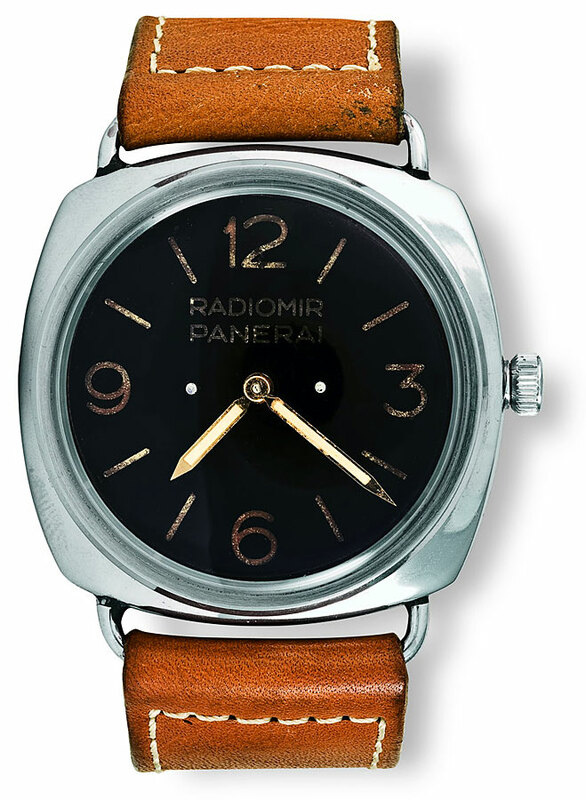 This watch has a current value of $120,00 and is the second rarest collectable Panerai. According to the Author, only 30 of this Reference 6154 were ever made. 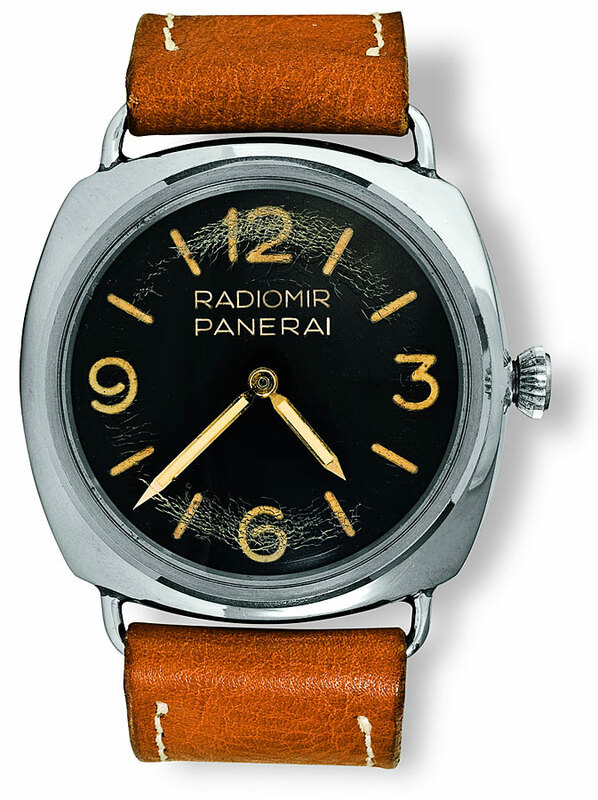 The most collectable and valuable would be the one existing example of the first Panerai Reference 2533 prototype. 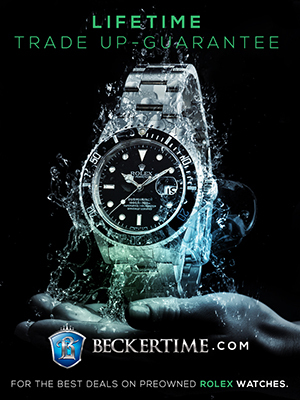 The Rolex diving watch pictured in the illustration above is not in the book. 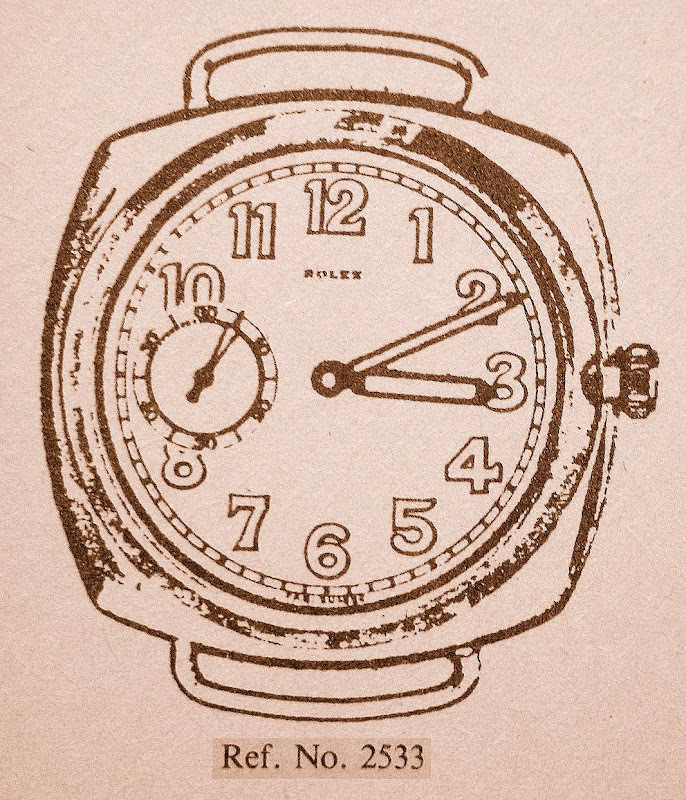 The illustration is from a rare 1935 Rolex brochure and the watch was a honking 47mm. 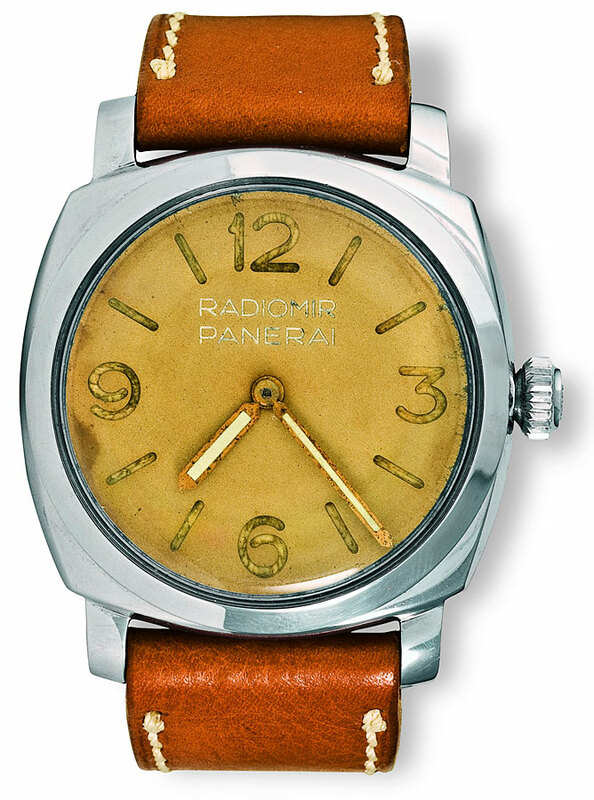 This is the Rolex model Panerai used to make its first Rolex made Panerai (as seen below). 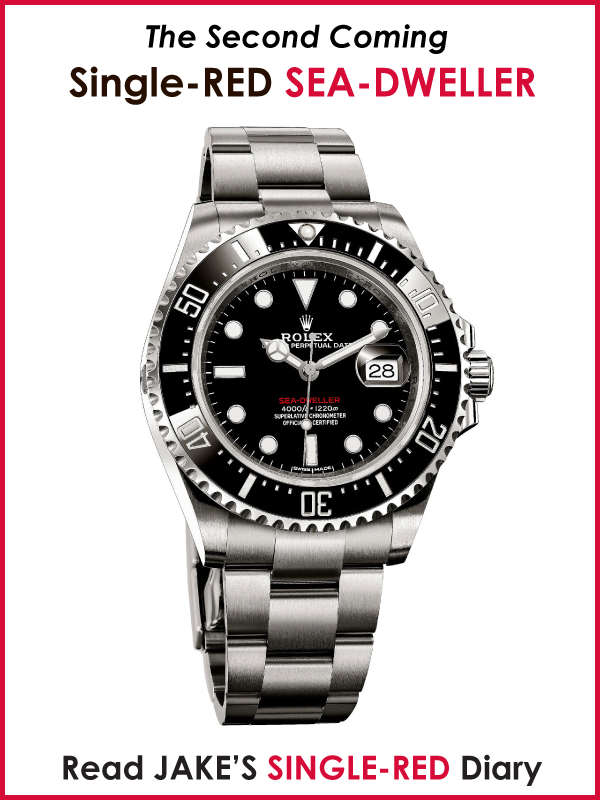 The illustration above appears courtesy of John Goldberger and according to John, he has never seen an actual example of the Rolex Reference number 2533 because it is so rare. I imagine since it was 47mm it probably did not sell very well, so maybe Rolex simply swapped out the dials, and movements and sold the resulting watches with no name on the dials to Panerai. 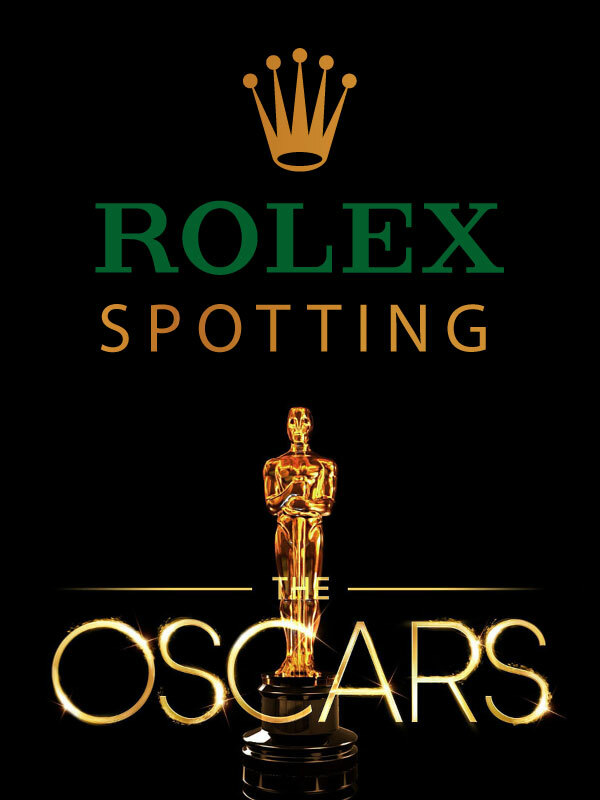 This may explain why there are no known examples of the watch that appear in the 1935 Rolex catalog. I was doing some follow up research to best understand the genesis of this first Panerai model made by Rolex and I found a Timezone.com vintage Rolex thread where James Dowling said "My research on Panerai leads me to think Panerai essentially took an existing Rolex model and had Rolex adapt it to their specific requirements. 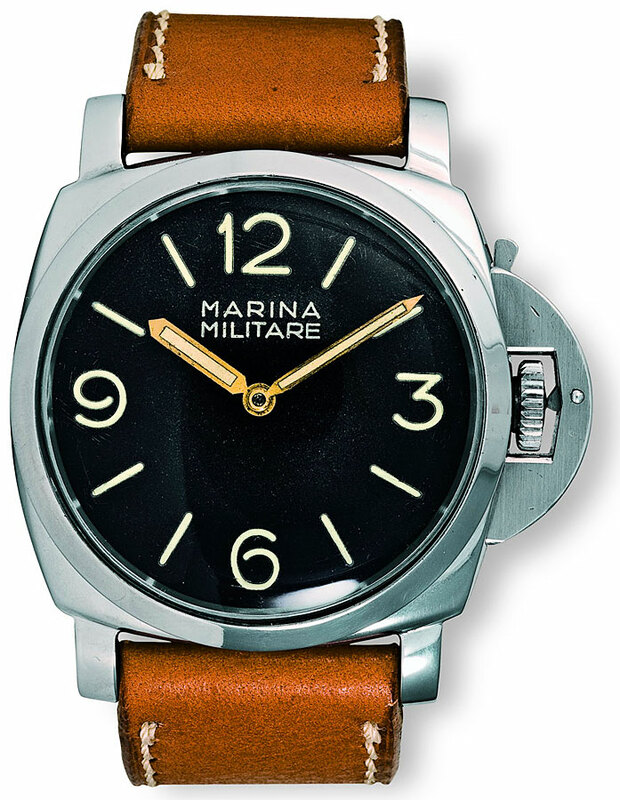 Amongst them was this reference 2533, which is essentially the Mk1 Panerai. 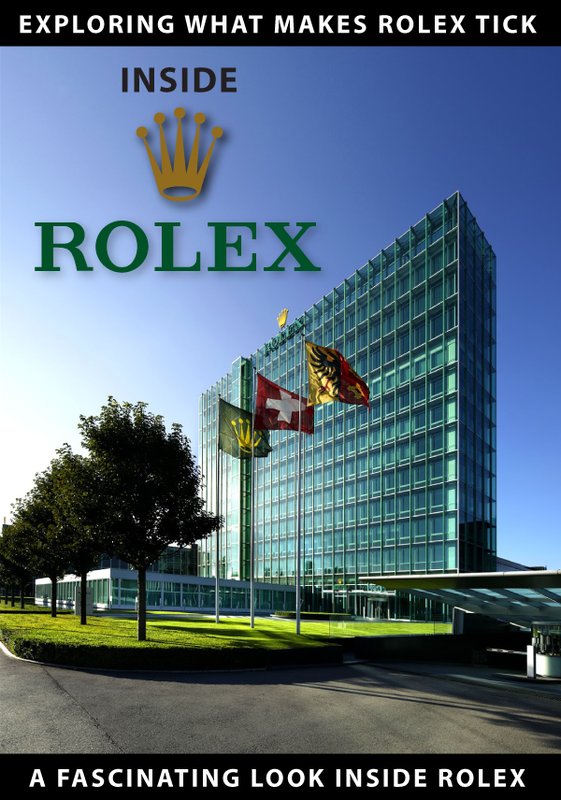 But then, of course, Rolex already had the basis of this watch in their catalogue, in the form of the Rolex Oyster Pocket watch." So there you have it! Apparently Rolex experimented with putting wire lugs on their 47mm Oyster pocket watch and created the Rolex Reference 2533, and this went on to become the basis of the Panerai diving watch. 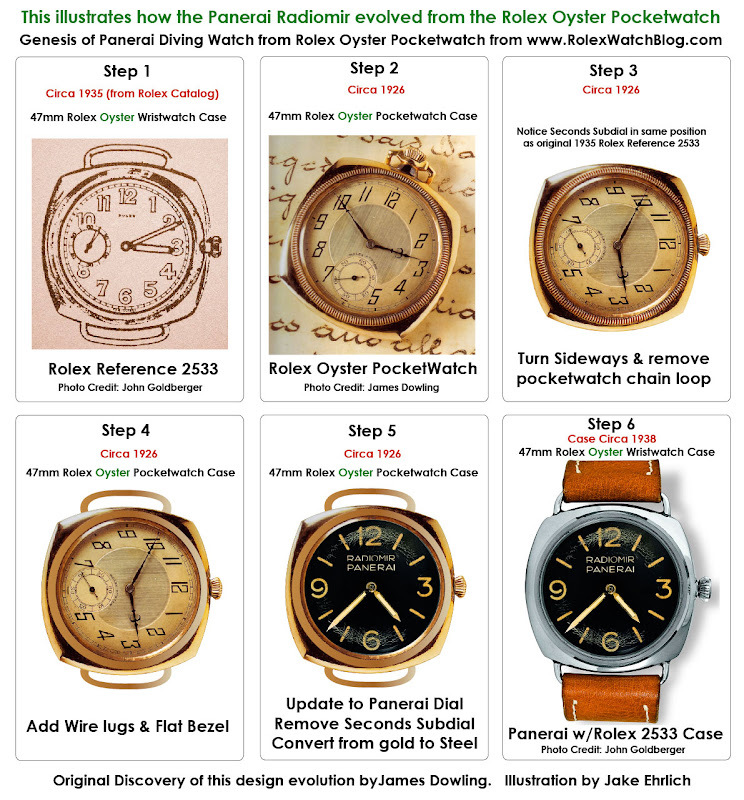 After finally figuring out and understanding this design evolution I decided to create the following graphic to illustrate step by step how the 47mm Rolex Oyster pocket-watch evolved into the original 47mm Panerai. One of the obvious questions is "how did you attach and remove the leather band on these early wire lug Panerai watches if the wire lugs were soldered to the watch?" You guessed it!!! You had to sew the leather band onto the lugs. Panerai makes a very similar 45mm version of this watch today known as the Panerai Radiomir with the vintage wire lugs but they are no longer soldered on, but can removed with two very small screws in the watch body. This first Rolex Made Panerai, picture above is and Ultra-rare prototype of which there is only 1 known example on earth. Yes, you read that right–there is only one know example and you are looking at it picture above. 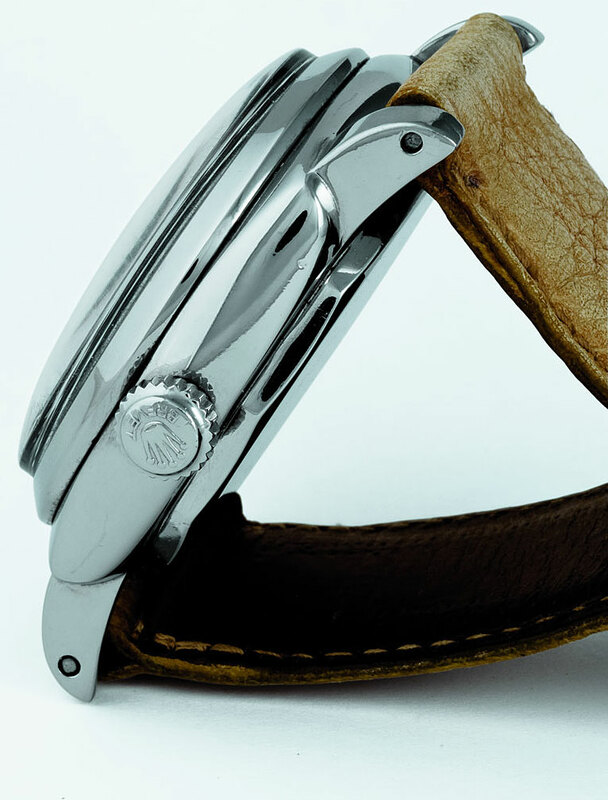 The Rolex made Panerai Reference 3646, pictured above has unusual art deco dial known as the California dial which has Roman numerals on the top and Arabic numerals on the bottom. This new model was different than its predecessor in that it had an onion shaped winding crown. 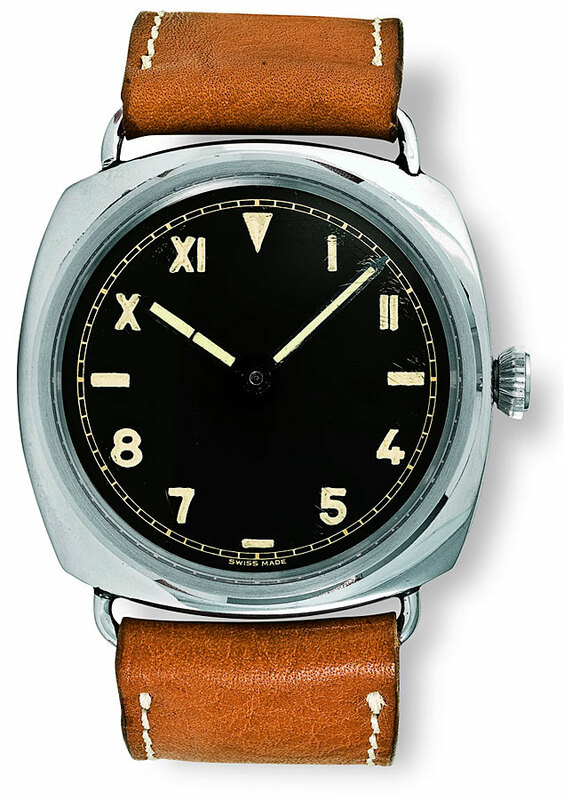 This is the first Rolex made Panerai with the trademark 3,6,9,12 Panerai Radiomor dial. 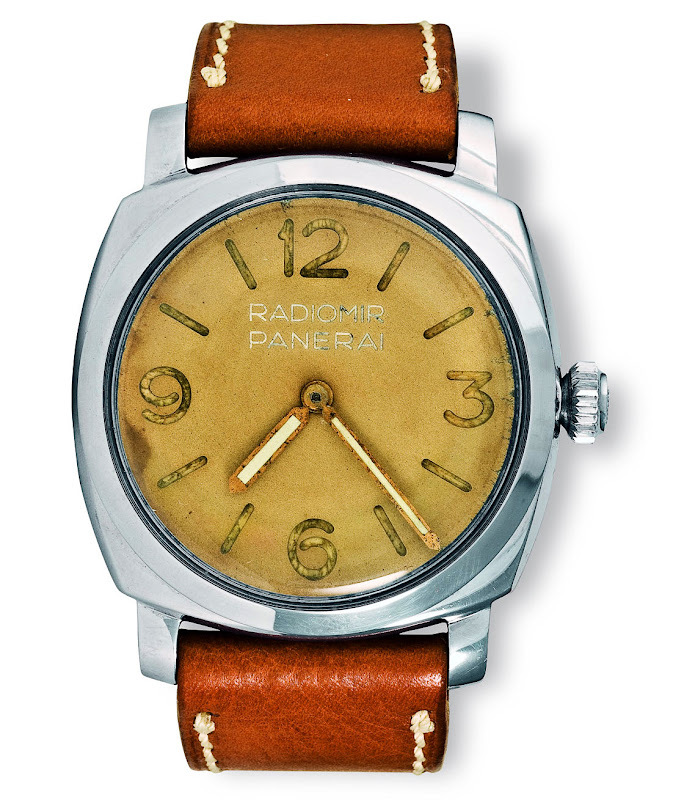 The Radiomor designation on the dial of the watch was used because it used Radium lume to illuminate the hands and dial in the dark. The dial on this watch is a plexiglass Prototype. 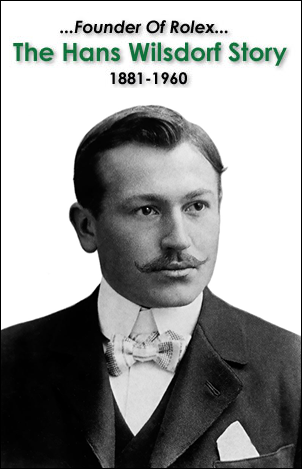 Radiomir lume was patented in 1915. 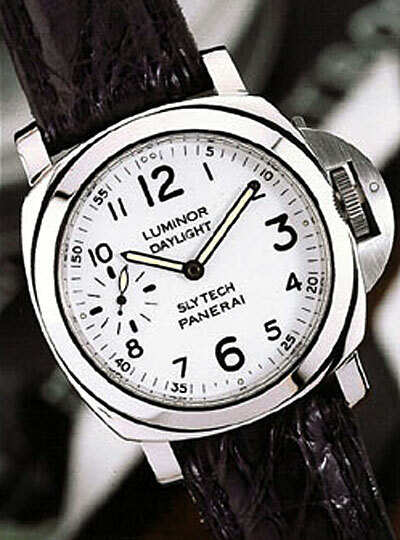 Later Panerai Luminor watches would use Tritium to illuminate the hands and dial and the current generation Panerai watches use Super Luminova lume to light up the dial and hands. This next Rolex made Panerai, pictured above has the classic 2,6,9,12 Radiomor Panerai dial with the onion shaped winding crown. 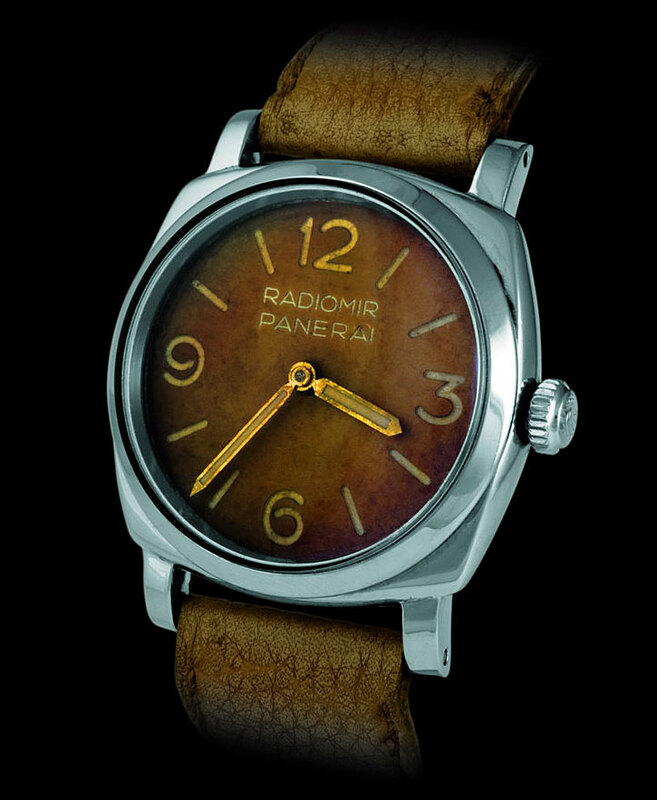 This is the last Panerai model made by Rolex in 1956. It was made for the Egyptian army and they only produced 30 examples. The reason the dial is a light brown or even tan is because the radium based material they used for the markers and hands had a radioactive effect on the black dial and caused it to get much lighter. 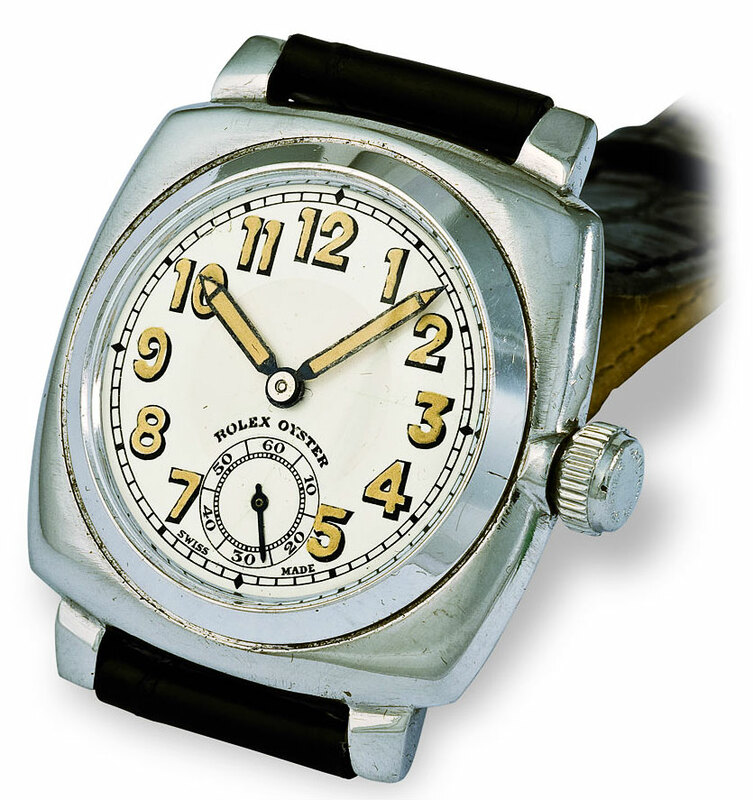 Rolex began making Panerai watches for the Italian Royal Navy in 1936 and the watch above is from 1941. 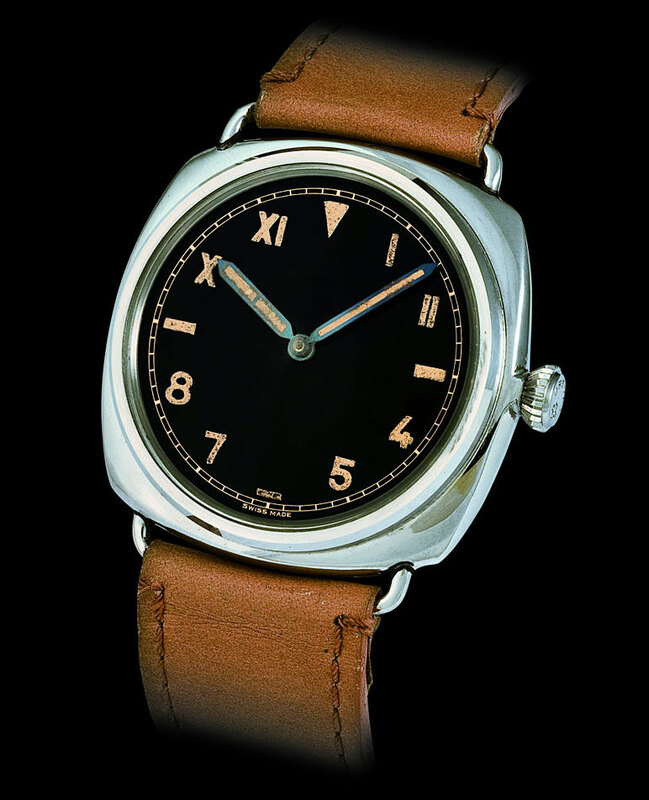 It has Roman numerals and Arabic numerals on its dial with no Panerai designation. 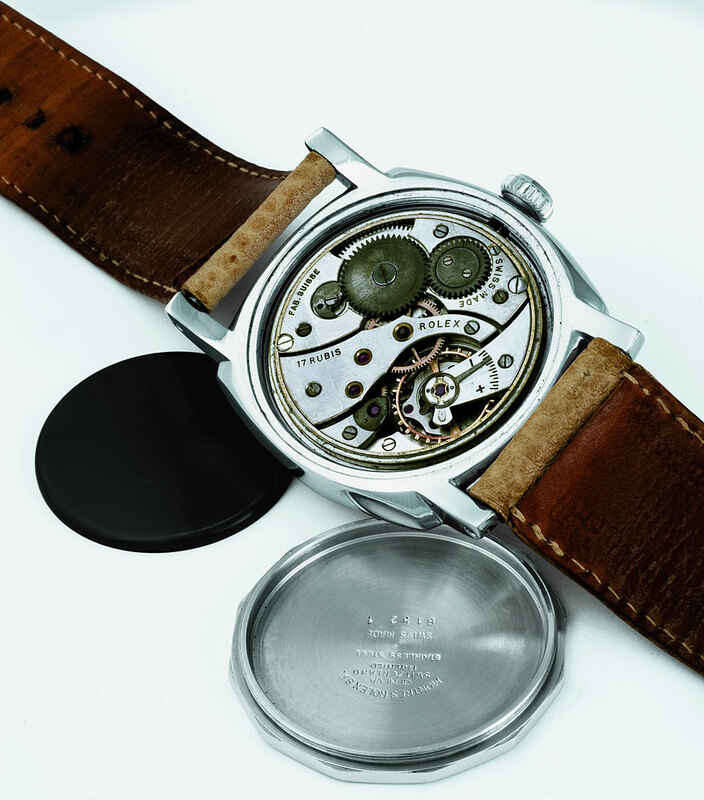 Its current market value is $80,000, and according to John Goldberger only 600 of the Reference 3646 were ever made. In this next photo below from the Philipps Collection–which does not appear in 100 Superlative Rolex Watches–we see a vintage cushion shaped Rolex Oyster from 1936 with the soldered wire lugs next to a Rolex made Panerai 3646. The resemblance is unmistakable. It is fascinating to note that the owner of the Panerai pictured above does not wear the watch very often because it is still radio-active. Remember if you want to see more detail in the photos on this page just click on them. If you are listening to the podcast in your browser and following along with the images on this page just open another page for viewing the images and let the podcast play in the original browser window. 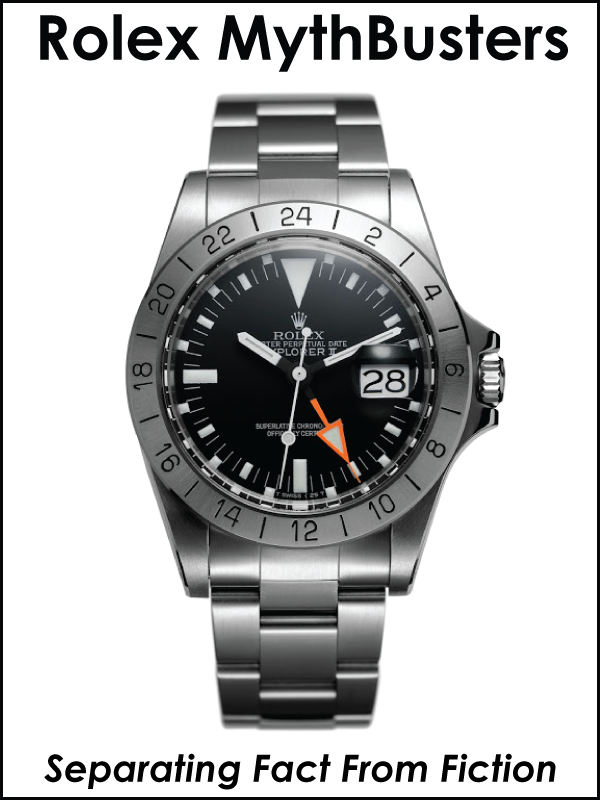 This next image is of the same watch pictured above and below. 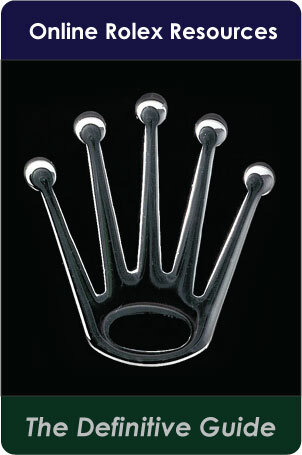 You can see the Rolex Brevet designation and Rolex crown logo on the winding crown. Brevet means patented in French. 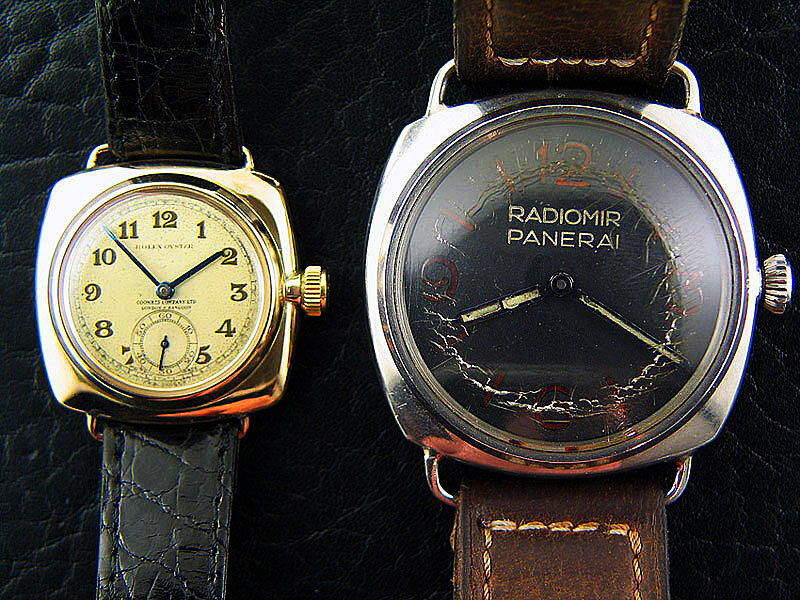 After 1956, Panerai kept producing their watches but Rolex no longer made them. Apparently Panerai stopped making watches for the Italian Militare in 1993 because it was not longer cost effective, and Panerai decided to focus on producing watches for the general public. The watches were not very successful. 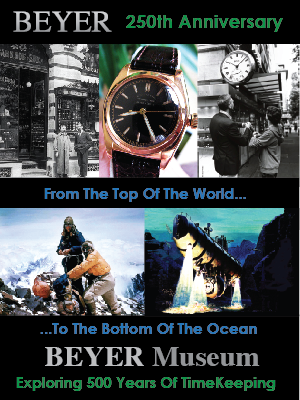 As a matter of fact, between 1993 and 1997, Panerai only produced 1828 watches. Of course, this would all soon change. 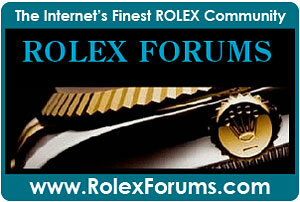 Please note the following six images are not from 100 Superlative Rolex Watches. I added them for historical context. 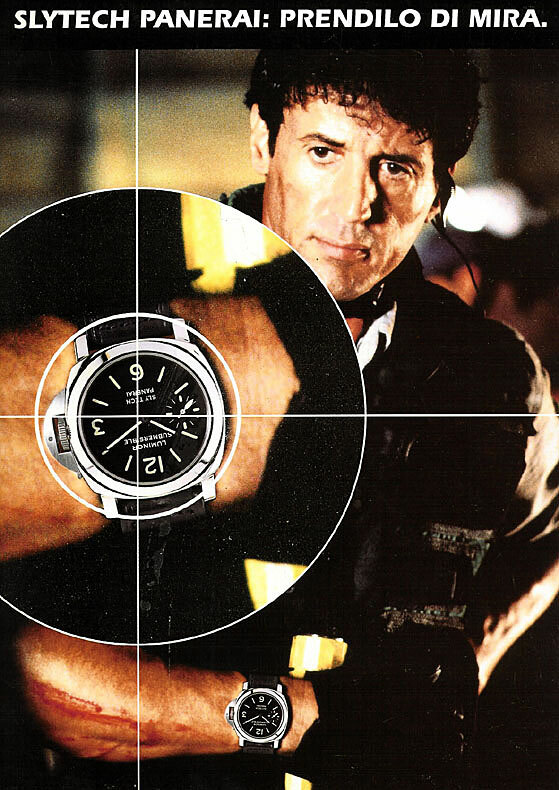 In 1995 Sylvester Stallone noticed a Panerai watch in a Roman jewelry store and decided to wear the Panerai during shooting of the film Daylight which hit the big screens in 1996. 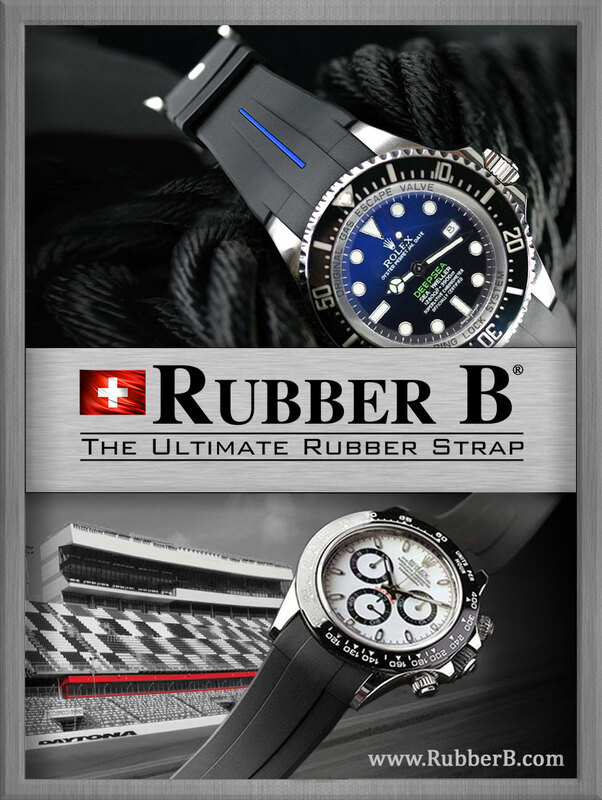 Stallone was so impressed that he ordered a bunch of watches with his Slytech signature on the verso (case back) and the Slytech Daylight model came was introduced to coincide with the film. 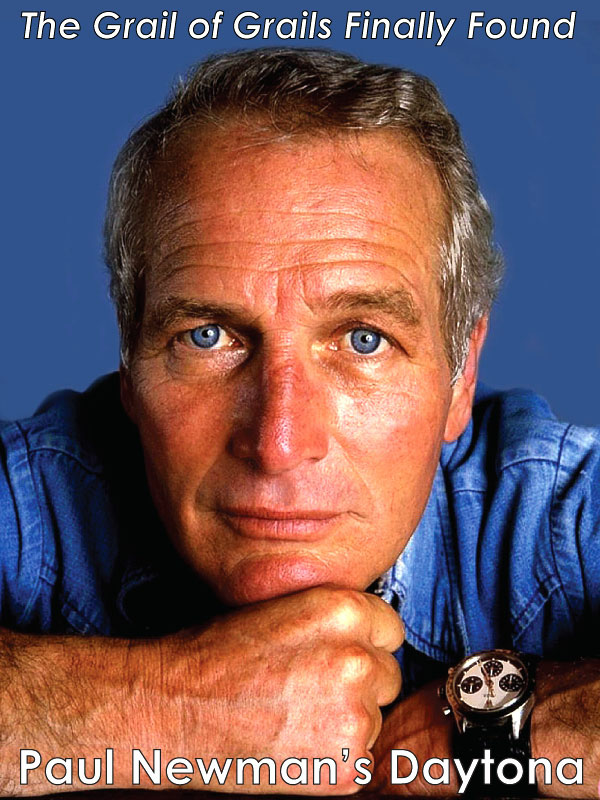 Stallone gave the Panerai's to friends as a gift, including Arnold Schwarzenegger, and from that point the Panerai brand took off and became very popular. 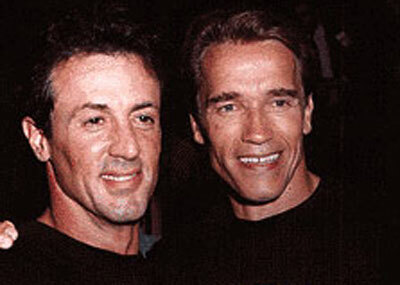 It is interesting to note that prior to wearing Panerai watches, Sylvester Stallone and Arnold Schwarzenegger wore Rolex watches. 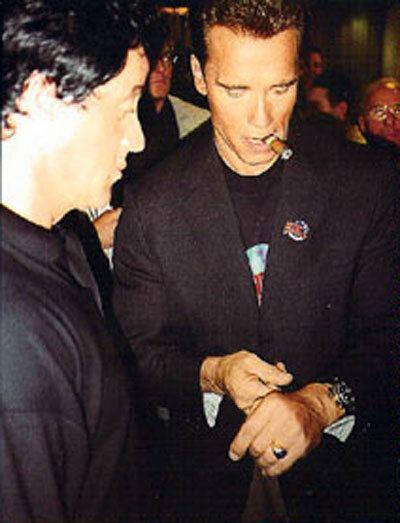 Sly wore a yellow gold Rolex Day-Date and a Rolex Submariner, and Arnold wore a yellow gold Rolex GMT Master with a matching Jubilee bracelet. 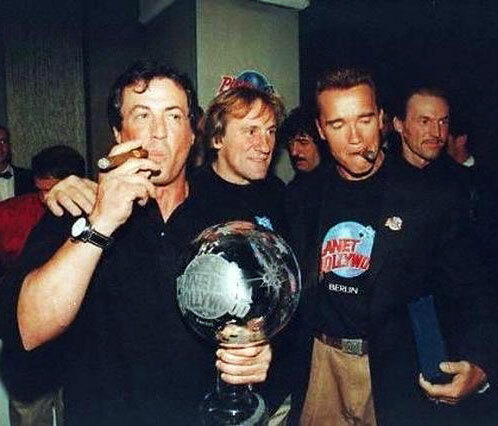 You can see photos of them wearing their Rolex watches by clicking here for Arnold Schwarzenneger and clicking here for Sylvester Stallone.